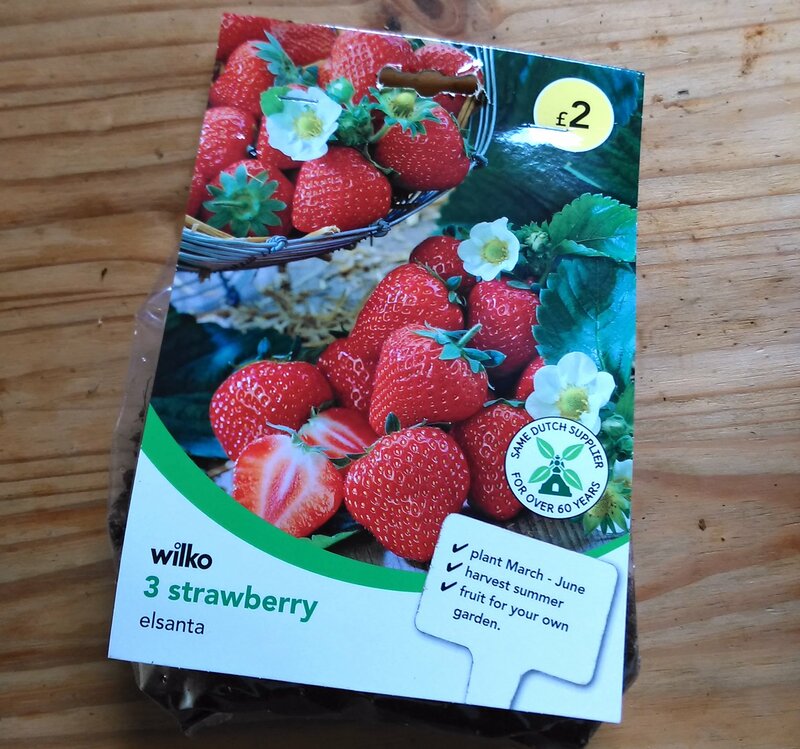 I bought a small pack of three bare root Strawberry Elsanta plants at the weekend, from my local Wilko store for £2. I’d spotted them before, and looked at them curiously, but after watching a few videos on bare-root strawberry planting, and just how resilient they are, I thought i’d give them a go. Bag of bare-root Strawberry Elsanta plants from Wilko. I already have Strawberry Elsanta plants in my garden pots, and they have consistently survived winters, thrown runners, and produced a crop of tasty sweet red berries. Buying more just makes sense, and after watching a number of YouTube videos on the topic, I thought i’d give some bare root ones a go. CaliKim’s video below explains how to handle them, and she’s absolutely right when she says ‘they don’t look like much‘ – they really don’t. They look like dead dried-up terrifyingly large wolf spiders. I unpacked my bag and rummaged around to find the brown, lifeless, dry clumps of rooty-straw things. In her example, you can clearly see which bit is roots and which bit is leaf, but mine were less obvious until i’d let them soak in the water (and essentially washed them). Having put some multipurpose compost into three little pots, I added the plants, ensuring that the crowns of the strawberries were about half a cm above the compost line so that it would not rot off and would not dry out. I have stood them outside with the rest of the Elsanta plants, and hope they begin to wake. 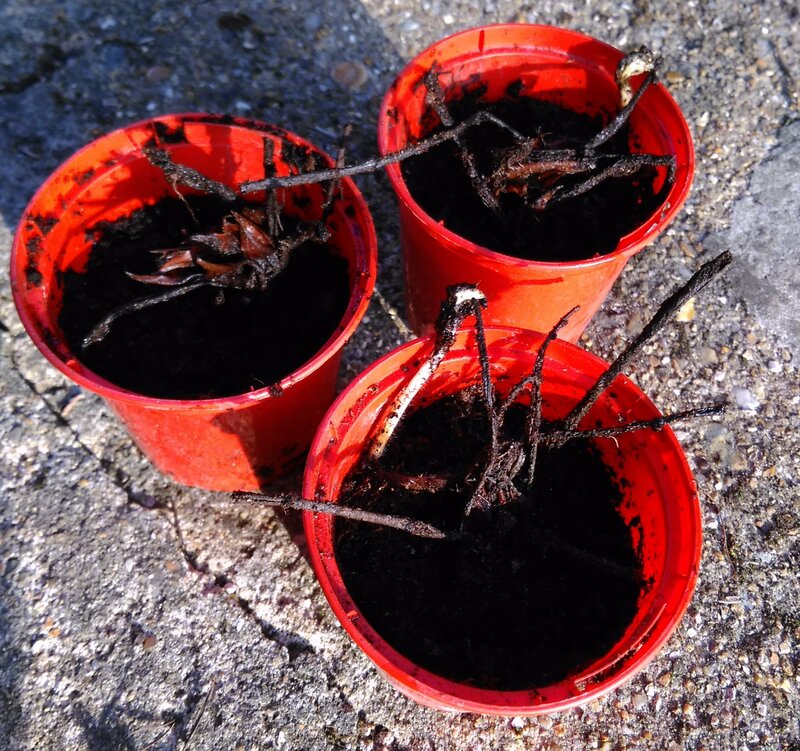 The bare-root Strawberry Elsanta plants potted up and ready for sunshine. They still don’t look like much, but at £2 for what could be more delicious strawberries from a variety that I enjoy, it’s worth the experiment. I’ll keep you posted on whether they spring to life. I’d love to hear if you have tried bare-root plants before, and what your success rate is. Let me know in the comments below.